“How Business, Government, and Social Enterprises are Teaming up to Solve Society’s Toughest Problems. Imagine the world if we were able to double, triple, or even quadruple the number of problem solvers, the diversity of solutions, and the scale of social impacts. Imagine if every government emulated NASA and opened up its toughest challenges for the world to solve. The Power of Hackathons – A roadmap for sustainable open innovation. 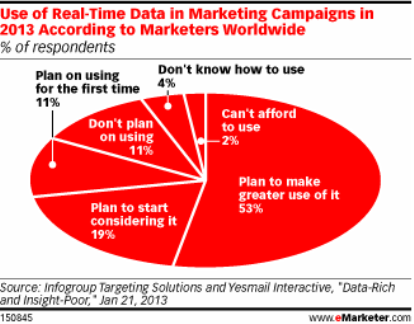 According to a eMarketer report, 53 percent of the marketers surveyed plan to make greater use of real-time data in their 2013 marketing campaigns. 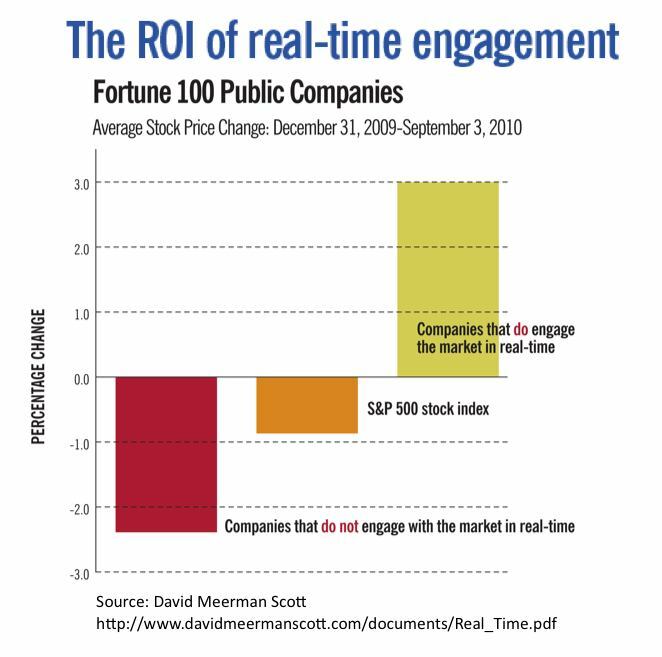 A comparison of 2010 stock prices reveals that, on average, the publicly traded Fortune 100 companies that engage in real-time communications beat the S&P 500 stock index while the others, on average, underperformed the index. “In order to become more real-time, brands must build the workflow and business process to efficiently and effectively execute on marketing tactics in a matter of hours – not days. This is a substantial transformation. 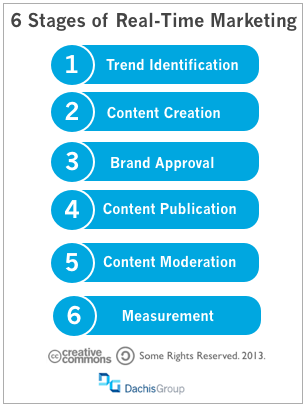 Trend Identification – Identify and select trends for brand participation. 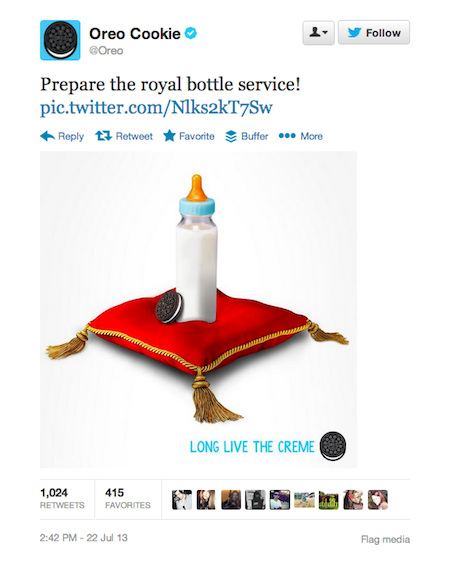 Content Creation – Create brand appropriate content for real-time insertion. Measurement – Measure performance of real-time marketing tactics. Generate reports and insights to aid optimization of future efforts. To get more details on how to implement real-time marketing in your organization, download this Dachis Group whitepaper here. 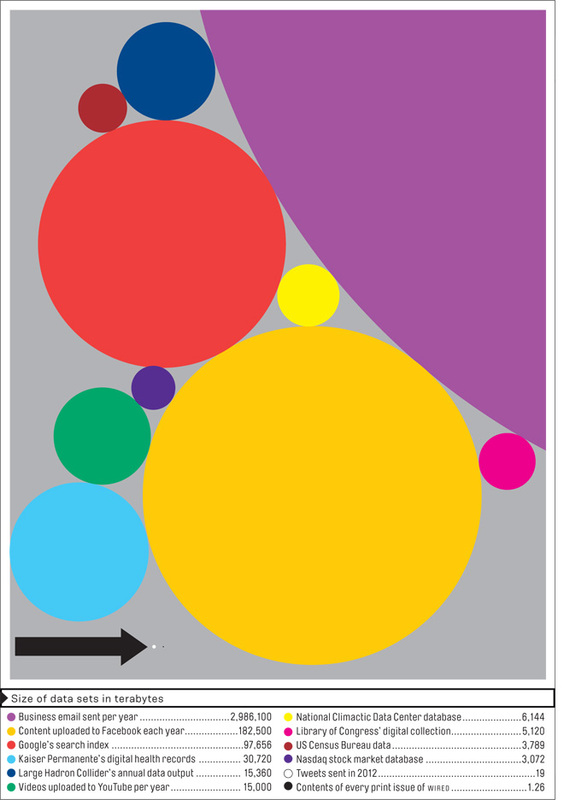 Information Revolution: Big Data Has Arrived at an Almost Unimaginable Scale | Wired. Speaking at the IAA Business Lunch in London about Digital Trends, Nokia’s Marketing Transformation and Unstable Media. My similar presentation at the ‘Digital Shoreditch 2013‘ conference in London, celebrating outstanding creativity. Participating in a panel about Societal Brands at Social Media Week in New York, taking a closer look at the evolving relationship of societal brands in our social world. Chinwag Psych Interview: Antony Mayfield & Chris Schaumann “Design your Day” interview about Nokia‘s “Design your Day” eBook, focusing on ways to adjust your day to get the most out of it. Group Session and Presentation with Collider12 and their StartUps, discussing about the death of industries, the rise of mobile, and speculation over just how much media will be digital in the future. Summary of ‘Digital Trends and Transformation’ Presentation at #RMIC14 in Iceland, 04/2014. Your hands will do the essential tricks. 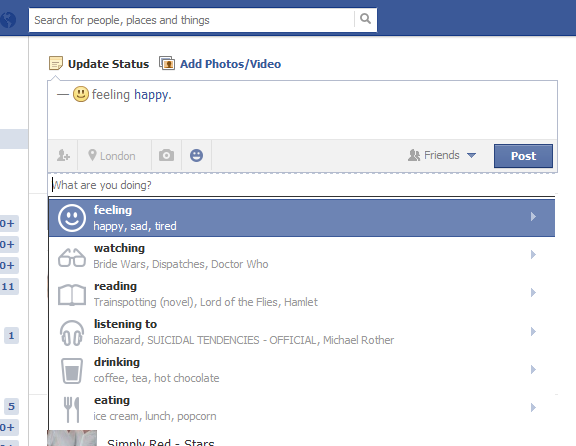 “If you’re seeing a new way to share status messages that include pre-thought-out actions such as “feeling,” “eating,” and “watching,” Facebook is doing a broad test of these actions”. “A slew of new partners are using Actions, the Facebook feature that will let developers make just about any verb a semantically cross-indexed link. Facebook-linked apps you use might show other lists — for example, clothes you’ve worn, products you want, books you’ve read, movies you’ve reviewed — anything you’ve talked about on the network or on Facebook-connected sites around the web. Discover what your friends are listening to/planning/collecting/discussing/thinking…all your stories will be told, not through a universe of apps, but universally on Facebook and with a structured context.